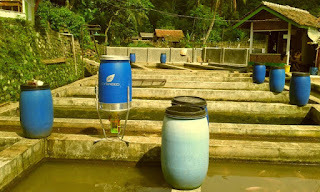 Agrotechnomarket.com - eFishery offers a smart fish feeding machine for commercial aquaculture. The feeder can sense the fish’s appetite through motion sensors, and if the fish are feeling agitated and hungry, the machine will feed it automatically. The company has also created the software for it, allowing fish farmers to see these feeding activities in real-time on their phones, and control the system if needed. Efishery has built its own hardware and software, including sensors to monitor the water motion of a pond. If sensors detect certain motions, the feeders can determine that fish are agitated and hungry, and then release food. The app lets farmers see when this is happening in real-time on their phone, and further control the system should they feel the need. El Farizy runs his company out of Bandung, a suburban city in West Java just outside Jakarta. He earned a Bachelor’s degree from the Bandung Institute of Technology before starting eFishery in November 2013. His experience in both tech and aquaculture allows him to be that natural pioneer of “fishtech” in Indonesia. El Farizy claims his target market is interesting because few other players have thought to penetrate it. “Aquaculture is already a billion dollar industry, rapidly growing, but it has a lack of innovation. I saw it as a huge opportunity for a new technology business,” he explains. 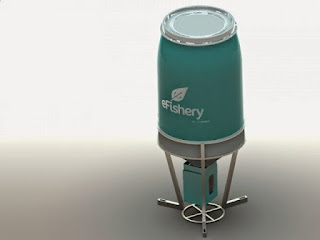 0 Response to "Efishery, the Smartest Fish Feeder"